❤❤Floating toys party. The toys set will come with 9 colorful fishes and 3 fishing rods. Kids could play it alone or with friends. ❤❤Cute fish also as a water gun. Kids could squeeze the fish in the water, then put it up, it will spray water out from the fish mouth when kids squeeze it, which will bring more joy in the games. ❤❤Bright color and cute fish can attract kids attention. 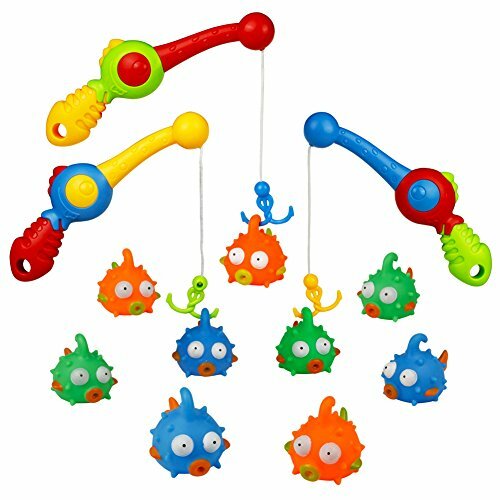 Because of the bright colors and cute appearance the fish set can make kids like to take shower. ❤❤The fishing rods made of high quality plastic, and the hook has been rounded to protect kids in the games. The fish was made of high quality material. Kids could play it safety. ❤❤It suit 3+ kids as a water / beach / swimming toy. It need adult supervision while kids playing it .